I've loved doing the A SMALL CHAT series because as a small space dweller myself, I've picked up tons of inspiration! one of my first interviews was with Robert of Sixx Designs. Becoming a fan the second I flipped through their great book, I love the couples cool style and eclectic vibe and am looking forward to checking out the new show on Bravo premiering next week, 9 on Design. This cool space pictured from one of their flipped spaces inspired this little spring-themed collection of sweet pops of color that would look lovely in a small space. 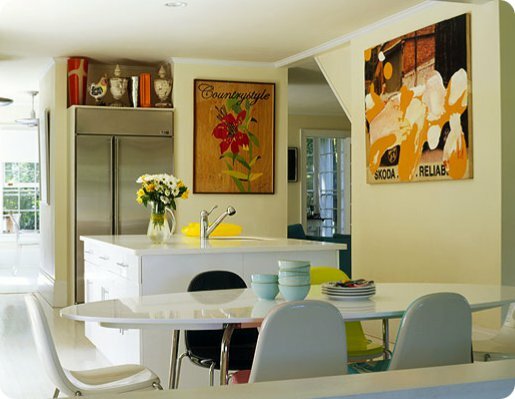 9 Responses to "pops of color and flipping houses"
wow! I love this all. dreamy! it's not at IKEA anymore? I love it too! Hey just came across your blog. I just love the concept! And though I usually dream about a big dream house but after seeing this beautiful picture of the kitchen, I have set out a space in my dream for a small, loving home! thanks, nitz! I know, love this kitchen too!